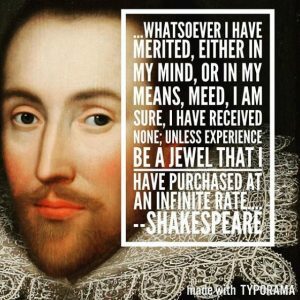 To be (relevant) or not to be (relevant), that is the question high school students ask when it comes to reading Shakespeare. In response, Fund for Teachers Fellows annually set out for Stratford Upon Avon and related sites to prove how a 400-year-old bard has still got game. 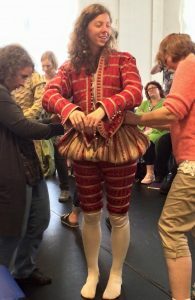 Gretchen Philbrick, teacher at Norwich Free Academy in Norwich, CT, crammed as much Shakespeare into three weeks as possible, seeking him out in three countries. She participate in the European Shakespeare Research Association convention in London; attended the Gdansk Shakespeare Festival in Poland; and explored Romeo and Juliet’s Verona. “Shakespeare lessons ‘test my mettle’ as a teacher,” she said. “I must come up with relevant, properly scaffolded, high interest lessons in which students can discover just how capable they are and walk away as confident Shakespearean scholars.” She uses the Instagram feed named for a Shakespeare quote (@experiencebeajewel) to share videos, incorporates puppetry into readings and analyzes with her students global adaptations of Romeo and Juliet from locations as varied as Bollywood and Iran. “Shakespeare marks a significant stage in a student’s development. Once students “get” a Shakespeare text, they beam & their sense of accomplishment is evident!” said Gretchen. Danielle getting in character at The Globe Theatre. Danielle Peck (Grosse Point South High School – Grosse Pointe Farms, MI) participated in the “Teaching Shakespeare Through Performance” program in London to learn new methods of teaching that inspired creativity through performance. Classes at the Globe Theatre informed her own, as she shares strategies for mastering texts through analytical reading and writing. an annual performance of Romeo & Juliet on campus in collaboration with a professional theatre company. Engaging middle school students in classic literature and theatrical performance was the motivation behind Lyndsey Jones-McAdams‘ fellowship. 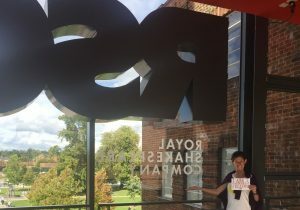 In addition to participating in a Greek performance workshop in an authentic amphitheater, she conducted research at the Royal Shakespeare Company in Stratford Upon Avon. 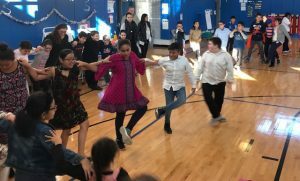 This week, her fourth and fifth graders at P.S. 264 in Brooklyn completed a “Classical Remix Theatre Collection” which she created. In collaboration with a professional theatre, students read original texts in an abridged manner and adapt them for the school community (comprised primarily of Middle Eastern immigrants). “My students adapted A Midsummer Night’s Dream into an immersive theatre piece, where we transformed our school into Ancient Athens and students and families traveled our building to visit and become a part of the world of the fairies, mechanicals, and young lovers!” said Lyndsey. “At the end, they all (audience included) participated in a traditional Greek wedding dance to celebrate the weddings of the young lovers and the Duke and Duchess. Joan Williams (Knoxville, TN) will investigate political and folkloric history of Macbeth in England and Scotland, particularly differing performance strategies and historical interpretations, to establish thematic context for existing interdisciplinary courses (AP World History/Literature) and incorporate site-based research into a new Shakespearean Performance curriculum. David Williams (Colchester, CT) will attend the Teaching Shakespeare Through Performance course at the Globe Theatre in London to learn practical approaches for engaging students from a variety of backgrounds and academic levels. Julie Davidson and Ann Hasenohrl (Westlake, TX) will participate in Kristin Linklater’s Advanced Course on Shakespeare’s Monologues and Scenes in the Orkney Islands of Scotland to apply innovative and differentiated strategies that bring Shakespeare to life for diverse high school students. Jacqueline Catcher (Exeter, NY) will tour literary sites associated with famous British authors, including William Shakespeare, the Bronte sisters, and Horace Walpole; examine the impact of Gothic architecture in the development of characterization and theme in Jane Eyre; and study canonical literature at the Oxbridge Teacher Seminar at the University of Cambridge to create differentiated and engaging learning for academic and AP English students. Ryan Campbell (East Hartford, CT) will walk in the footsteps of Shakespeare’s “Macbeth” in England and Scotland to strengthen personal knowledge of British history and topography that, in turn, enhances literary competency and global awareness of International Baccalaureate students. Diana D’Emeraude (Austin, TX) participate in a Shakespeare training program for middle and high school language arts/theatre teachers at the Globe Theatre in London to to create curricular units with authentic lessons for my students to help students develop critical thinking skills to be applied in the classroom and beyond. John Matthiessen (Branford, CT) will participate in Globe Theatre’s “Teaching Shakespeare Through Performance” course in London to learn practical and play-filled approaches to teaching Shakespeare in the classroom and increase student engagement in the reading and performing Shakespeare. “I dreamed of sharpening my teaching skills so all of my students can come to see Shakespeare,” said John, “not only as a manageable reading experience, but as a doorway into a world where some of our lives’ most fundamental dilemmas take physical form and stride believably toward their inevitable resolution, whether comedic or tragic.” Although Hamlet says, “A dream itself is but a shadow,” John’s dream will be realized this summer on his fellowship. Follow him and all of our Fellows here on our blog.